There’s a well-established aesthetic value placed on the economy of line in a skillful drawing. Vector-based re-topology that interprets the high detail of other mediums offers an interesting perspective on this tradition. 'Vector' as a motif has become a popular style in graphic design and visual art, particularly over the past few decades, essentially it’s a digitally native aesthetic. There are plenty of tools for interpreting existing imagery to vector automatically, but what I've found interesting is not the common application of reducing a recognisable image to a low polygonal count by algorithm, but instead reinterpreting the complexity of an existing subject. The process also has its own special relationship with the common dilemma in creating any artwork: when to stop! The success of this high polygon, two dimensional style relies heavily on subjective cognitive perceptions of depth and detail. Our eyes and brains instinctively compensate and fill in detail when looking at a primitive form. This is true of high and low counts of polygons. In this first example, as below, in this quick study (a manual vector sketch) from a photograph of the Swedish architect Gunnar Asplund, even a low count of polygons retains a considerable sense of detail. 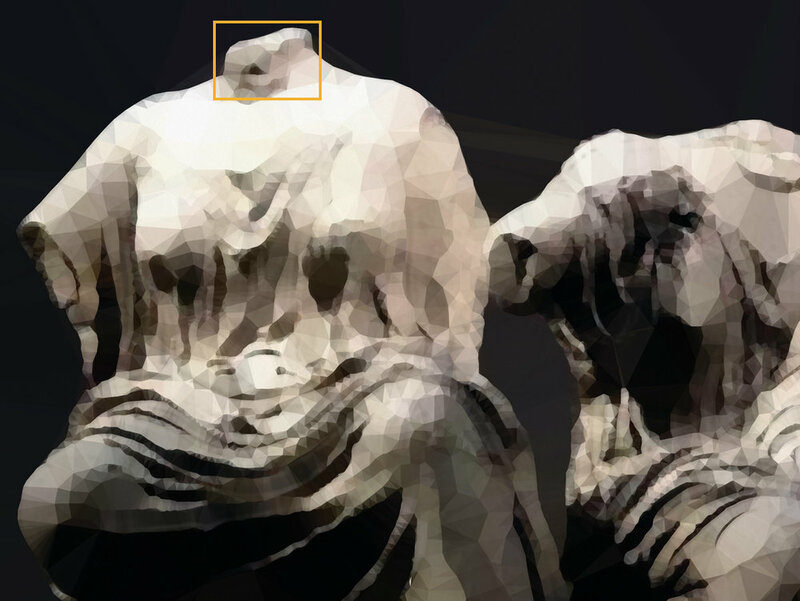 Moving on to a high polygon vector study, the subject below is a favourite sculpture, infamously known as the Elgin Marbles. Originally part of the eastern pediment of the Parthenon, atop the Acropolis of Athens, it resides controversially in the British Museum. It’s been proposed that the figures are Hestia, Dione and Aphrodite, formed as part of a narrative about the birth of Athena. Although another suggestion is that the two figures on the right are the personification of the Sea, Thalassa, in the lap of the Earth, Gaia. The figures are remarkable for their naturalistic portrayal of anatomy blended with the masterful rendering of light drapery across the bodies, predating the Hellenistic period. The isolation of the figures as an object in its own right, also encapsulates its own visual poetry, thanks to the embellishments and vicissitudes of one thousand, four hundred and fifty plus years. The absence of the figures' heads competes visually with the objects sense of completeness. It serves as an artful metaphor for the Cartesian struggle in the mind/body problem: a contemplation of absence in an object with its own sense of completeness. 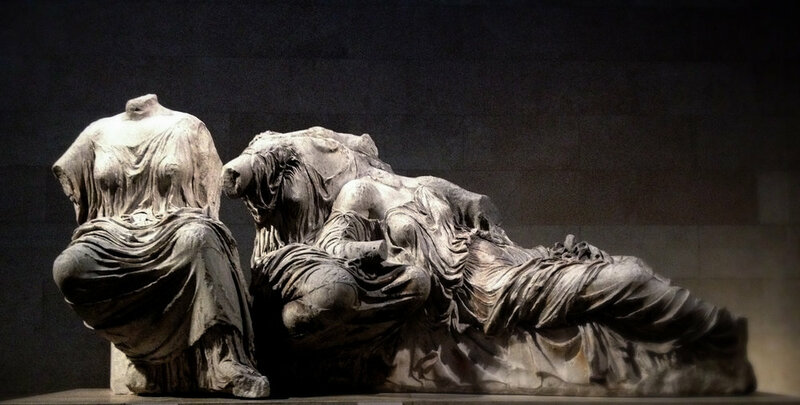 Dualist delusions aside, the dark provenance of the sculpture, essentially a looted section of the Parthenon's eastern pediment, has left us with a poetic and exquisite object regardless of whether we try to put these qualities into words! 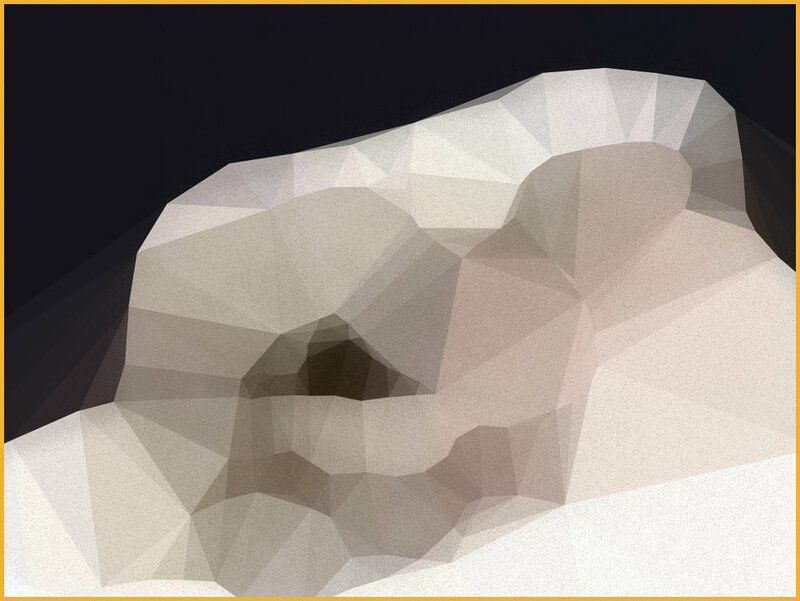 In the image above you can see the polygonal subdivision, derived by manually tracing the form from the original photograph, and dividing it into about 10,000 separate triangles. The manual process is really half the argument here: if it’s not traced by hand, then the proposition that there’s a relationship between this process and the economy of line in a skillful drawing, is lost. However, manual tracing also informs the second half of the argument: the sense of depth perception. At a distance, the vector rendering of the composition works on par with the photograph, as the eyes and brain work to present more detail than is really there. But as one approaches/zooms the image, detail gives way to a nonsensical, disruptive pattern of polygonal forms. Points of contrast become natural borders in the choice of the size and shape of the individual polygons. The vector version is infinitely scalable and the larger the image in ratio to distance from viewing, the greater becomes the impression of detail. Meanwhile closeup, the angular forms disrupt the degree of detail we otherwise might expect to see.